Dentures are dental prostheses which replace missing teeth. They can either be full or partial and are removable. With dentures, you not only get a beautiful smile, but you can also eat better! Indeed, dentures have a lot of benefits. That’s why a broken denture is a denture wearer’s nightmare. Add to that the fact that they can break without warning. This, therefore, constitutes an emergency. Your daily routine is affected, leaving you utterly inconvenienced. At Ria Family Dental we have same-day emergency appointments for dental emergencies including broken dentures. All dental restorations have a breaking point, and dentures are no different. Despite their durability, years of strenuous chewing, biting, grinding and other teeth functions can cause them to deteriorate. Accidents can happen anytime. Even the most careful person may suffer an accident. 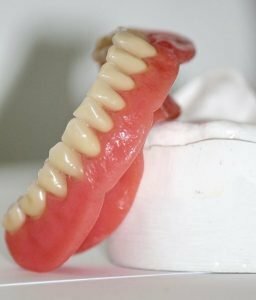 Damage from dentures accidentally falling while cleaning is an example. Your dentures have limitations. To maximise their use you have to follow precautionary measures. For instance, using your dentures for other that their normal functions or abusing their limits can cause breakage. Ill-fitting dentures can be caused either by progressive bone loss or poor dental work. If you feel uncomfortable with your dentures, visit your dentist immediately. Emergencies cannot be predicted. However, vigilance and caution can help blunt their effects. When cleaning your dentures, check for cracks. If you see cracks on your dentures, do not attempt to fix them yourself. You might be tempted to use denture repair kits available in drugstores. This only worsens the damage. It takes the skill and knowledge of a professional to repair your dentures. Call your dentist immediately to repair your dentures as soon as possible. If the damage is minor, your dentist may repair it in the office immediately. If the dentures are broken or if they don’t fit you perfectly, new measurements will be taken for your new dentures. In case of a dental emergency, call and visit your trusted Ria Family Dental team. We have a same-day emergency appointment to relieve you of your pain as soon as possible.